In the last 4 days I have butchered near enough to 300 birds as makes no difference. The last three days have all been above 100 degrees. One might think there would be a smell. Well, there is a slight odor when you’re next to the compost pile. Otherwise, not so much. 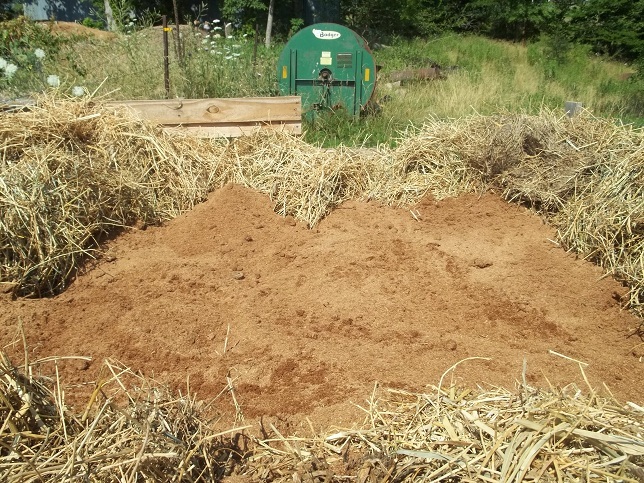 Here’s how we build the compost pile. I build my piles with pallets since pallets are free. 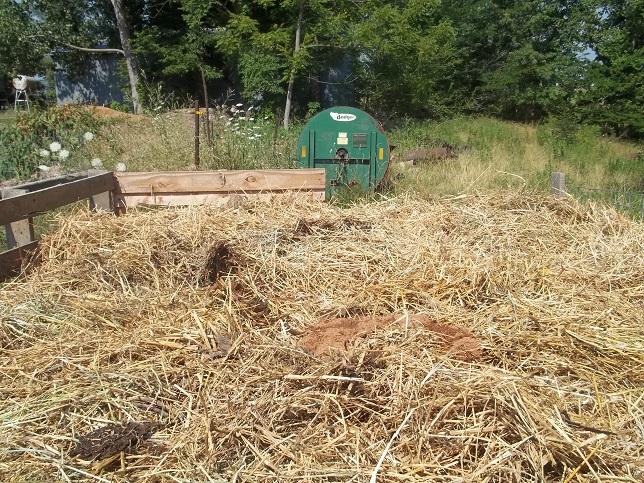 The pile needs to be a minimum of 3’x3’x3′ so it has enough mass to heat up. 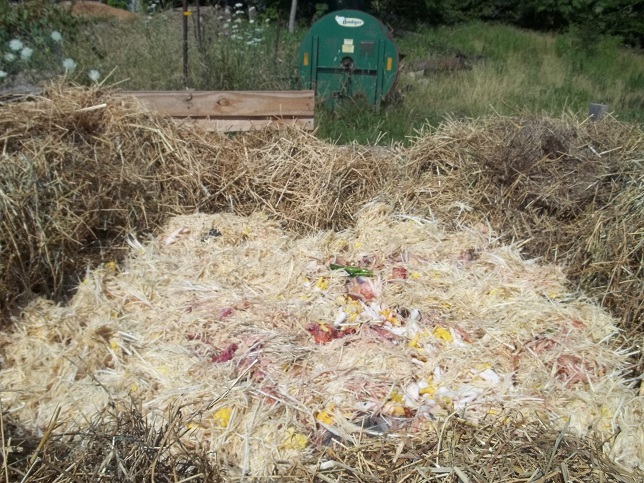 It is important that your compost pile “cook” itself when you’re adding in manures or animal wastes. They will digest more quickly keeping the scavengers away. Normally I use 8 pallets wired together with baling wire in a big 2 pallet by 2 pallet square. We dig a slight depression in the ground in the center of the pile. 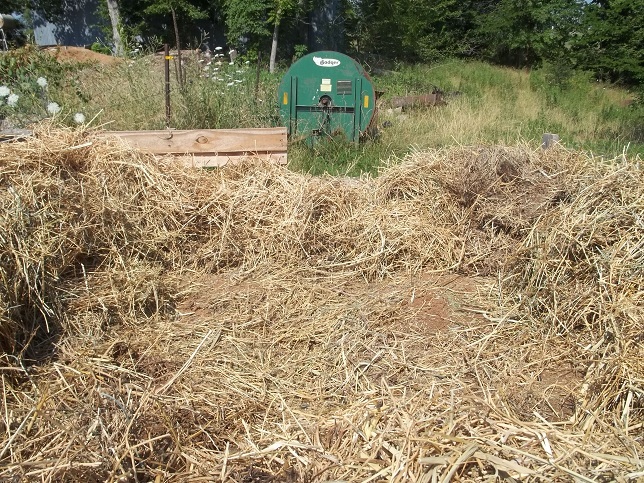 Then we add a foot or so of straw, old hay or, better yet, bedding along with a shovel or two of finished compost. From then on, we add layer after layer of compost and carbon. These pictures reflect the maturity of the pile. We’re nearing the top. I should also point out that I don’t stir my compost. That’s too much like work. I just let it sit for 12-18 months and feed it keep it hot most of that time. Biology does the rest. First I scrape away the covering material from the top. 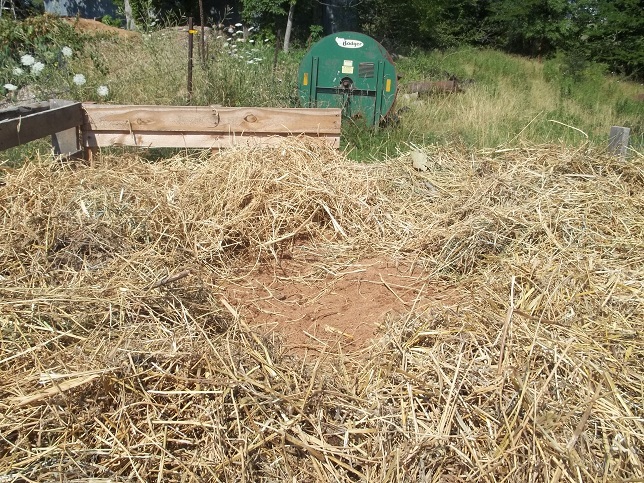 This is 6 or 8 inches of used bedding and hay the goats rejected. I pull the material to the edges of the pile leaving about a foot-thick wall around the perimeter. Next I cover the offal with an equal volume of sawdust. I’m shooting for 2-3″ of sawdust here. The carbon absorbs the nutrients, sponges up moisture and keeps the smell down. Then I pull the covering material in from the edges and cover as well as I can. We’ll need more material but it’s a start. The goal is at least 6 inches of covering material. That allows moisture in if it will ever rain and filters odors. So, there you go. Our current pile is 6×6. It should last us until we start a new pile on April 1st. If not, I’ll get two more pallets and make it a bit longer. Good luck with your composting. Don’t overthink it. If it stinks, add carbon. If it’s not hot, add nitrogen. Stacey has some good ideas on that topic.